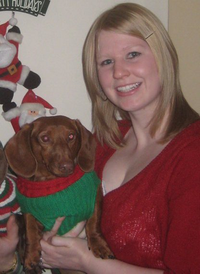 Jennifer Rennard is our Media Relations Specialist at Paw Print Genetics. When she is not tweeting and posting, she is on location at dog shows and conventions spreading the word about optimal canine genetic health. She has been a lover of dogs her entire life. As a child she was a member of 4-H and owned a beautiful AKC Cocker Spaniel named Jazzy whom she showed in conformation and in obedience dog shows. Currently The Rennards are owned by two six year old dachshund brothers, Teddy and Blazer. The newlyweds adopted the boys 3 years ago and get a good taste of parenthood each day. Jennifer is enthusiastic to reach a broad audience through creative online social media and personally as a vendor when attending canine events.